“Memories From a Sh*t Hole” is the Whodunit’s 4th album. Recorded and produced by Jim Diamond himself! 13 songs full of Jeffrey Lee Pierce and Lux Interior’s ghosts as well as The New Christs, Nomads, James Leg and Tow Wait’s influences. 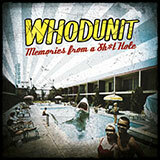 Garage anthems, pure punk songs, tortured boogie blues tunes, that’s Whodunit!